The Walking Dead season 8 episode 9 review: Was killing Carl really necessary? It’s been a long hiatus from the mid-season finale of The Walking Dead made especially longer because of the huge cliffhanger they left us with. Chandler Riggs is leaving the show and they’ve made sure that there is no way to wiggle out of this one. Carl has been bit by a walker and it some how ended up being just one bite and on his chest. We aren’t sure if we are going to find out how this ended up happening, but we hope there’s a good explanation for it. While we understand they wanted to make sure it was in an area that couldn’t be amputated, this was kind of a weird spot for us to imagine getting a bite let alone just one bite and not a gorging. So how did Carl get bit? Tonight we learned that it happened when Carl was out with Siddiq killing walkers (a walker crawled up and bit him in the torso while he was fight another walker) and that he was bitten through out pretty much the entire mid-season finale. Because he knew he was a dead man walking we saw him spending time with Judith, taking pictures with his family, planting trees, soaking up the sun, writing goodbye letters to everyone he loves and basically giving himself a really positive last day. This is exactly the Carl we love and exactly what we would expect from him. Watching Carl give Rick his goodbye letters kicked us right in the heart. Right. In. The. Heart. Rick wants to put his rage about losing Carl on Negan and the Saviors, but hearing Carl explain to his dad that he was out helping Siddiq and that’s how he got bit we hope that this is really sinking in with Rick and that he can carry the torch moving forward. What we don’t want to happen is for Rick to take out his rage on Siddiq and completely miss the point of what Carl was moving towards, and we think that Carl explained why he went back in a way that reached Rick. It wasn’t about the fact that Siddiq has medical training, it’s about helping other people regardless of their walk of life or what they can offer and coming together for a larger purpose. One of the things we really appreciated about this episode was when Carl started talking about when his perspective on this world really changed. Back at the prison he shot a kid that was putting his gun down and how easy it was to kill him – that he could’ve just kept going down that path, but chose something different and it was all because of Rick. He watched Rick stop fighting and bring all of those people into the prison to help them. It showed Carl another way and a path he wanted to continue down. Carl tries to get Rick to understand that killing his way through life isn’t the way, that there has to be something after all the killing – a life. Watching Carl’s goodbye to Judith gave us some hope for Rick taking Carl’s torch and moving forward, especially when he told her that sometimes the kids have to help the adults lead the way and that she is going to beat this world in a way that he didn’t. Siddiq tells Carl that he’s going to honor him by continuing to pay it forward and build on what Carl started. His goodbye to Michonne was brutal, especially when he told her that she’s his best friend. Michonne has been many things to Carl over the years: A protector, a friend and a mother figure. We saw some flash forwards (that have been going on all season with old man Rick) that included a better world where everyone gets along and works together, just like Carl was hoping for. As it turns out these “flash forwards” were really what Carl imagined in his mind of how things could be and something to work towards. Rick goodbye promise to him is to work on making Carl’s dream become a reality. Some of it can become a reality, we really think that Carl was leading the way towards this, but Negan being a part of this perfect utopia – gardening and smiling at children – is something we have a hard time buying into. We are still not ready to say goodbye to Carl ourselves, even after watching him say goodbye to Rick and Michonne right before shooting himself in the head. We did like that Carl took control of his own death, that was something we felt was right for his character. The last shot of Rick bleeding out at a tree with stained glass hanging from has a lot of people thinking that Rick’s going to die, but we more so think that it’s a symbol that he tried to rebuild (was this stained glass something he made to rebuild the church Carl died in? ), but that he failed to do what Carl was trying to accomplish. There were a lot of other things going on in this episode like the Saviors taking Ezekiel, and Carol and Morgan trying to rescue him, but nothing else really stood out to us in this episode through the tears of losing Carl. Instead of making this episode an hour and a half and including this Ezekiel storyline they should’ve just made it an hour and focused on Carl. Don’t get us wrong, we like Ezekiel a lot, but in this particular episode we had a hard time being engaged in what was happening to him because we were too far down the hole with Carl. Related – Check out what’s coming up for episode 10! Losing Chandler Riggs’ Carl is a real loss to us. 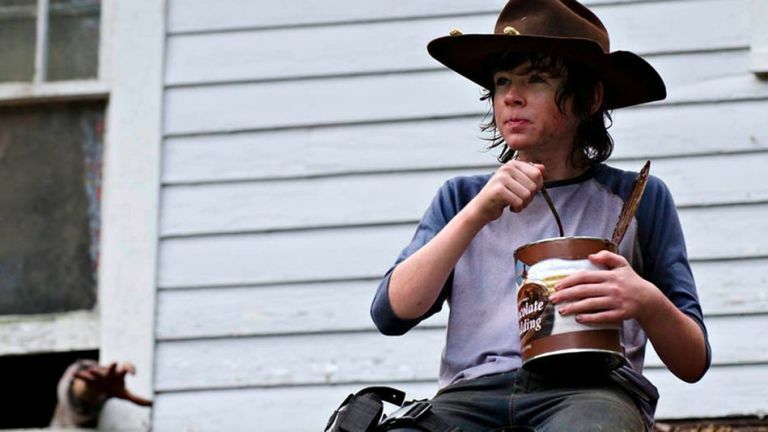 We know that not everyone has been Carl’s biggest fan, but ever since the episode where Carl and Michonne went on a supply run together and he ate that giant can of pudding, we’ve been a Carl fan and we don’t care who knows it. He’s grown into this amazing character that gave us hope for a real future for society in that world. He’s the only character on this show that has grown up in this world and probably understands it better than anyone because of that. While everyone else was looking for a way to survive each day, he was looking towards the bigger picture – a place where people would not just survive, but actually thrive and have fulfilling lives together as a more normal society. With that hope now being gone with his death, we have to admit that it’s going to be really hard for us to believe in that again, because there is really no one else that has this way of thinking. Could Rick or Michonne adopt that thinking and carry it on? sure, but it’s not going to be the same. We are really going to miss that element that Carl’s character brought to The Walking Dead and we honestly aren’t sure if the show can recover from this loss.